As some of you may have noticed, the posting hasn’t been quite as frequent as normal. Typically, Angela does 80-90% of the posting, compiling most of the deals, freebies and events while I tend toward posting about living frugally at home through gardening, baking, etc.. Well, with Angela on vacation the last two weeks I have stepped up and done my best to keep the deals coming, and while it takes quite a bit of time, I actually have been having fun too. I am, however, quite happy that she is coming home today! Instead of reinventing the wheel check out moneysavingmom for the weekly deals and for some more moneymakers , then go on over to commonsensewithmoney for a few of the month long register rewards going on. School Zone workbook, clearanced $.75! 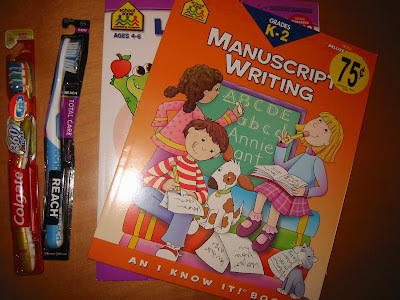 There were a bunch of clearanced books, flash cards, learning workbooks and coloring books there all priced between $.50 – $.75. I am planning on home schooling and thought these would be a perfect addition to my curriculum. The books would make great, inexpensive gifts for birthdays as well. All summer stuff is marked 75% off. I got a couple of toys and two books, total $3. I appreciate all the work you both do. Thanks so much!